Low cost electrochemical or infrared (IR) approaches used in safety systems to monitor for flammability typically do not have sufficient sensitivity to identify emissions, except when in close proximity. Conversely, high-sensitivity gas sampling equipment, such as cavity ring down or tunable diode laser absorption spectroscopy (TDLAS) can detect leaks at long distances, but are inefficient for localization and quantification. IR cameras, on the other hand, that can image methane emissions perform better at leak localization. However, IR cameras have low sensitivity leading to missed leaks, and are strongly affected by environmental parameters, making them unsuitable for leak quantification. These restrictions limit their effectiveness and applicability to occasional use by trained users. Monitoring pipelines, in particular, requires the ability to rapidly inspect hundreds, if not thousands, of miles of infrastructure. As the United States transports more natural gas via pipeline, and with clusters of oil and gas production sites in specific basins, there is a growing need for a low cost, mobile system, such as a sensor attached to a fixed-wing aircraft or a helicopter, that can quickly survey infrastructure, detect intrusion, and sense potential pipeline damage across wide areas while pinpointing emission locations. Combining two existing systems—light detection and ranging (LiDAR) and backscatter spectroscopy—presents an opportunity to deliver sensitivity and precision in a small, lightweight unit at a low cost. 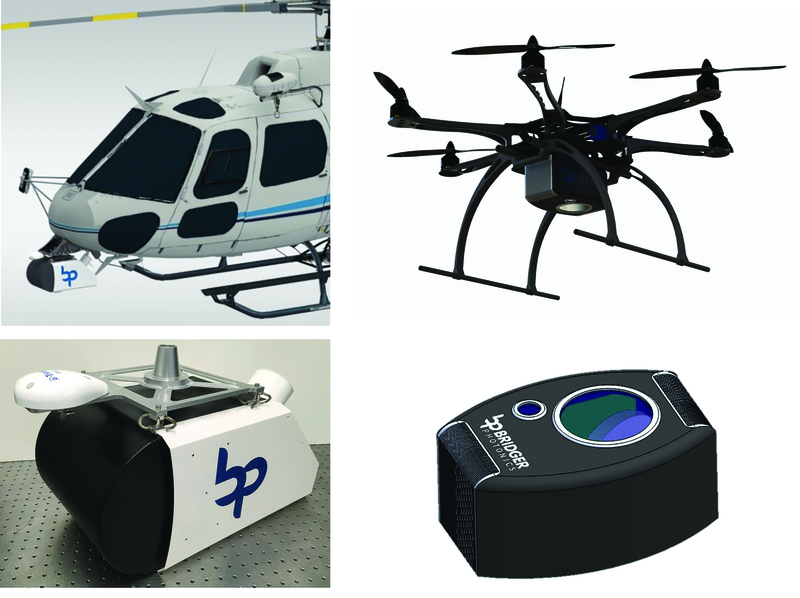 Bridger Photonics, Inc. (Bridger) is developing an aerial-deployable LiDAR system capable of simultaneous, rapid, and precise 3D topography and methane concentration measurements. The team’s compact, low cost, high power, laser amplifier system operates at 1650 nanometers (nm), allowing them to exploit a strong methane absorption feature while taking advantage of low cost, commercially available fiber optic components. Previously, commercial optical amplifiers did not exist at the 1650 nm wavelength, and diode laser source powers alone typically do not exceed milliwatt levels, a power output too low for long-range measurements and rapid scans. Through the ARPA-E MONITOR program performer network, Bridger partnered with MIT-Lincoln Laboratory, which had previously developed a high power (>0.5W), slab-coupled optical waveguide amplifiers (SCOWA), and under this award improved the SCOWA to perform at the wavelengths near 1650 nm and at low cost. The improved SCOWA performance enabled Bridger’s LiDAR system to be integrated onto unmanned aerial vehicles (UAVs) and fixed-wing aircrafts. The Bridger team then combined the laser amplifier system with a frequency modulation continuous wave (FMCW) LiDAR approach and a high signal-to-noise wavelength modulation spectroscopy to obtain high sensitivity measurements very rapidly. The hardware used for competing state-of-the-art systems is 100-240 lbs. and has a ~5 ft3 volume, which limits the types of aircraft and amount of flight time for deploying these systems. In contrast, Bridger’s SCOWA-based system for manned aircraft is 40 lbs. and ~1 ft3, which enables lighter payloads, greater measurement sensitivity, and lower costs. Figure 1: Bridger is currently building versions of their sensor for manned and unmanned aircraft. The team also leveraged its previous expertise in LiDAR mapping, originally developed for the Department of Defense, to integrate precision range measurements with gas measurements. The technology can map the geo-referenced topography of an oil and gas production site with GPS-limited accuracy and point cloud precisions of a few centimeters for the manned aircraft system and sub-centimeter for the UAV system. Additionally, the team developed 3D tomographic reconstruction of the methane emissions from its aerial data and a quantitative measure of the emission flow rate. The Bridger team is currently partnering with aerial companies that provide inspection services for oil and gas companies. For initial market entry, the team is focused on pipeline monitoring and is actively testing and pursuing deployment opportuntities with service providers. The team has obtained follow-on funding from the Alberta Upstream Petroleum Research Fund to perform initial flight tests of their technology. If successful, the technology developed under this project could help reduce fugitive methane emissions across the natural gas supply chain, helping to reduce costs, improve operational efficiency, and enhance workplace safety for natural gas operations. The mobile monitoring system could help gas producers pinpoint emissions across a large number of sites at a low cost per site. If this project succeeds in fully demonstrating its mobile methane leak detection system, the resulting system will enable cost-effective, highly scalable natural gas leak detection at oil and gas production facilities across a basin and along pipelines. As of January 2018, the Bridger project has generated two invention disclosures to ARPA-E. Two U.S. Patent and Trademark Office (PTO) patent applications have been filed on the disclosed inventions.